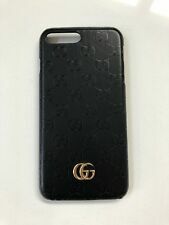 GUCCI iPhone X GG Microguccissima iPhone Case Black - Same Day shipping! GUCCIiPhone X GG Pattern Microguccissima iPhone Case Black. Gucci Case For Iphone 7 8 With Logo Black Leather Marmont. Condition is New. Shipped with USPS First Class Package. Gucci Case For Iphone XS Max With Snake And Logo. Condition is New. Shipped with USPS First Class Package. I do not have the box or papers for this item but it is in immaculate condition looks brand new. My buddy is a Hollywood producer and buys a lot of stuff that he never uses and this is in fact one of these type of items. Gucci Smartphone Case (1359). Shipped with USPS Priority Mail. Gucci GUCCY IPhone X Case Gold With Black Detaling. Condition is New. Shipped with Fedex. Just like original style and design. Gucci Case For Iphone XR with Logo Cardholder. Condition is New. Shipped with USPS First Class Package. Gucci MARMONT Case For Iphone XR black Leather With Logo. Condition is New. Shipped with USPS First Class Package. Gucci Case For Iphone XS MAX With Logo Snake Cardholder. Condition is New. Shipped with USPS First Class Package. This is only for one iPhone XR I also sell other iPhone models please shoot me a message if you are interested! Please also make sure that you take care of the leather when you receive the item! I only sell authentic cut up items I am also not affiliated with the brand at all! Also make sure that when asking or shooting offers this is an incredible price for a custom item! Iphone Gucci Custom Case. Condition is New. Shipped with USPS First Class Package. iPhone X Xs Gucci Phone Case RARE Leather And Snake Skin Black/grey. Shipped with USPS First Class Package. From SS17 and sold out everywhere. One of a kind. Made to be used at red carpet or the after party. The man behind the entire new and revolutionary look of Gucci. Fantastic quality and detail. Amazing materials too. IPhone plus cover, in great condition. Compatible with iPhone 7 or 8. Gucci Case For Iphone X XS With Snake Black. Condition is New. Shipped with USPS First Class Package. Gucci XR iphone pink wallet case. Shipped with USPS First Class Package. Gucci iPhone X Case Red With Vintage Logo NEW. Condition is New. Shipped with FedEx Ground or FedEx Home Delivery. Gucci Case For Iphone XR with Tiger Logo Red. Condition is New. Shipped with USPS First Class Package. Gucci Case For Iphone 7 Plus 8 Plus With Logo Snake Cardholder. Condition is New. Shipped with USPS First Class Package. Color appearance may vary depending on your monitor settings. Sizes listed are based on the item label. Item fit and sizing can vary by Manufacturer. Gucci iPhone X Hott Pink Logo Case. Condition is New. Just like original design. Synthetic leather. Shipped with FedEx Ground or FedEx Home Delivery. Has a small piece on the first "c" in Gucci missing (see pics). Non-Toxic silicone. Gucci Case For 7 Plus 8 Plus With Logo Green Leather Marmont. Condition is New. Shipped with USPS First Class Package. Gucci Case For Iphone XR With Logo and Bee. Condition is New. Shipped with USPS First Class Package. Gucci Case For Iphone X XS Black With Tiger. Condition is New. Shipped with USPS First Class Package. Gucci Case For Iphone 7 8 With Logo And Bee. Condition is New. Shipped with USPS First Class Package. Beautiful rose gold Gucci phone case, new in box. for iPhone x.